Baby’s day out can be compared to an action movie. It is challenging as you need to take every single thing that your baby needs – milk bottles, wipes, set of clothes, nursing blanket, etc. Will you be able to find the pacifier when your baby starts crying? Do you have enough room for these things? Many mothers make the mistake of trying to convert a typical purse into a diaper bag. But did you know that a diaper bag is a lot more convenient and appropriate for baby needs? It has many pockets to keep small items in easy reach, room for diapers and other essentials, and straps long enough to free your hands. Backpacks come in different forms: messenger, totes, stroller, and backpack. A backpack diaper bag looks like a regular backpack, but with more pockets for changing pads, wipes, and other essentials. It has enough room to put your items and allocate the weight evenly on your shoulders. You don’t have to hold it, so it keeps your hands free and do more tasks like carrying the baby more securely, holding the door, or reaching for something. 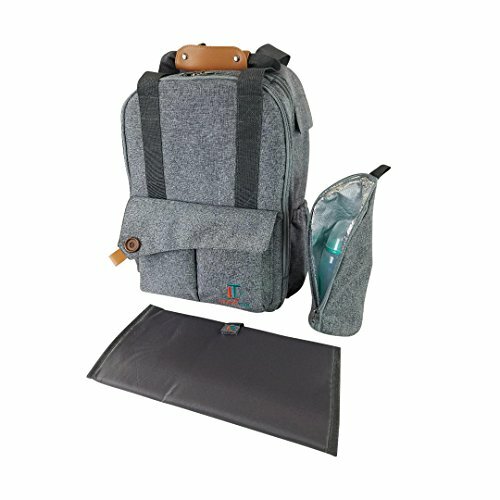 Too many backpack diaper bags to choose from? Here’s one best-selling brand that’s worth the price: the Laguna Tide Diaper Bag. What makes it special? What are the advantages of having it? Laguna Tide Diaper Bag is very affordable. It has dimensions of 17.5 by 7.5 by 14 inches and weighs 2.3 pounds. This Laguna Tide Diaper Bag is an excellent backpack diaper bag. Based on the abovementioned features, here are the advantages and some flaws of this Laguna Tide Diaper Bag. Using a regular backpack for a day out with your baby can cause inconvenience. It might not have pockets for baby essentials and be too small that it won’t fit everything you need. If you really want to have an easier day out with the baby, or run an errand with them, use a real diaper bag. Fortunately, newer brands of diaper bags come in more stylish designs. One of the best-selling diaper bag brands with a good style is the Laguna Tide Travel Diaper Bag. It is a multi-functional backpack diaper bag that stores all baby essentials. It has an insulated bottle pocket to keep the milk or juice hot or cold, and 12 pockets for other essential to be kept in an organized manner. The Laguna Tide Diaper Bag is made of waterproof materials to keep stains and liquid from setting. It is comfortable because its adjustable shoulder straps are padded. It also comes with a changing pad that you can use to keep your baby clean and comfortable when you have to change diapers. With the features and advantages above, Laguna Tide Diaper Bag is truly worth the money.